Reading progress update: I've read 45 out of 483 pages. 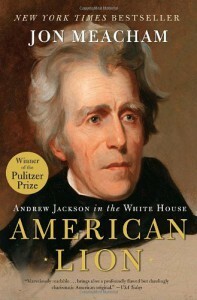 [Jackson] became convinced that Clay had sold his votes to Adams in exchange for the Cabinet appointment, and Jackson's fury at this alleged "corrupt bargain" never abated. "If at this early stage of the experiment of our Republic, men are found base and corrupt enough to barter the rights of the people for proffered office, what may we not expect from the spread of this corruption hereafter," Jackson told Lewis. Washington, [Jackson's wife] said, "was a terrible place." That the election unfolded to the letter of the Constitution did not matter to Jackson. If Jackson lived in the modern age, I bet he'd be royally pissed at a certain collection of missing e-mails, too.